Every few months, as budget news trickles in and transit executives start talking about alternative sources of money and revenue streams, naming rights are dragged up by activists and enthusiasts. The idea is that resourceful authorities looking to generate free money can sell naming rights to private companies who stand to benefit from brand recognition. Disney owns Times Square above ground so why not sell the name of the Times Square subway station to the company? On paper, it’s a great idea, and yet, in reality, it is one that has gained very little traction. In Philadephia, AT&T purchased the naming rights to the former Pattison Ave. complex at the end of the Broad St. line. They’re paying $3 million over five years. In New York, Barclays will append its name to the Atlantic Ave./Pacific St. complex with the Nets’ new arena opens, and they’re paying $200,000 a year for 20 years for that privilege. Finally, Chicago’s CTA worked out a deal with Apple for a station renovation sponsorship that includes the right of first refusal for subsequent naming rights deals. Only in Dubai, which managed to sell naming rights on 21 of its 23 stations before the emirate’s economy went bust, has seen prolonged marketing success. The MBTA is considering selling naming rights for everything from the lines and stations of its subway, bus and commuter systems to its Web site, smart phone apps and Charlie Cards. The MBTA is trying to close a projected $126 million budget gap for the fiscal year that begins in July. T officials are seeking a consultant to determine the feasibility of putting sponsors’ names on its assets and the revenue it could generate for the nation’s oldest subway system. “We’ve been pushing the last few months on a whole host of initiatives to try to capture non-fare revenue, from cracking down on parking scofflaws to possible naming rights,” Davey said. More visual sponsorships are a possibility. If the Red Sox [team stats] wanted to sponsor the Fenway Station stop near its ballpark, the lettering could be redone in the team’s signature font. High usage and accessibility make the T a “compelling medium,” according to its pitch to consultants, but a smaller naming-rights effort went bust in 2001. As Goodison notes, then-Transportation Security Kevin Sullivan tried to generate $22 million in revenue by offering up four popular subway stops — Back Bay, Downtown Crossing, South Station and Sullivan Square — for sale. The MBTA, however, received no offers even after extended the contract deadline and lowering the bid requirements. It’s beginning to sound like a familiar refrain. Meanwhile, as MBTA officials claim that the advertising market has since changed, the WMATA board in Washington is heading down the naming rights route as well. As AFP recently reported, DC’s Metro is facing a $72 million, and it too will look toward naming rights to offset its gap. “We’re looking for creative ways to try to close that deficit,” Steven Taubenkibel, a WMATA spokesman, said. In response to the news out of DC, Infrastructurist asks whether or not we should sell the naming rights to urban infrastructure, but I’m beginning to wonder if that’s the right question. Rather, is it at all reasonable to expect revenue from naming rights deals? Our limited experiences tell us that companies aren’t interested in shelling out big bucks, and many aren’t interested in shelling out any bucks. Citi, going through some tough financial times, declined to pay the MTA to slap its ballpark’s sponsorship on the Mets/Willets Point station in early 2009. It seems that, for one reason or another, private companies just aren’t interested. Maybe they don’t want to be associated with something we view as dirty and unsafe. Maybe they don’t want their corporate image tarnished by association with beleaguered transit authorities. Maybe they don’t find the branding efforts to be worth it. Whatever the reason, municipalities aren’t earning much from naming rights deals, and the attempts to brand seem to be going nowhere fast. Until the money starts flowing in, perhaps it’s time to put this idea to bed. I think you overlook another reason corporations aren’t interested in naming rights: nobody uses the corporate name. Do you think anyone will start referring to Atlantic-Pacific as Barclay’s? Have you heard a New Yorker refer to the RFK Bridge? The latter isn’t a naming rights deal, but it illustrates the point: when a name has become ingrained over decades, it’s hard to shake. In addition to lingering in people’s heads, it also lingers on maps, signs and guidebooks. I’m grossed out by the idea of station naming rights. The MTA can plaster posters on station walls. Wrap trains. It might be garish, but it’s not detracting from the fundamental usability of the system. 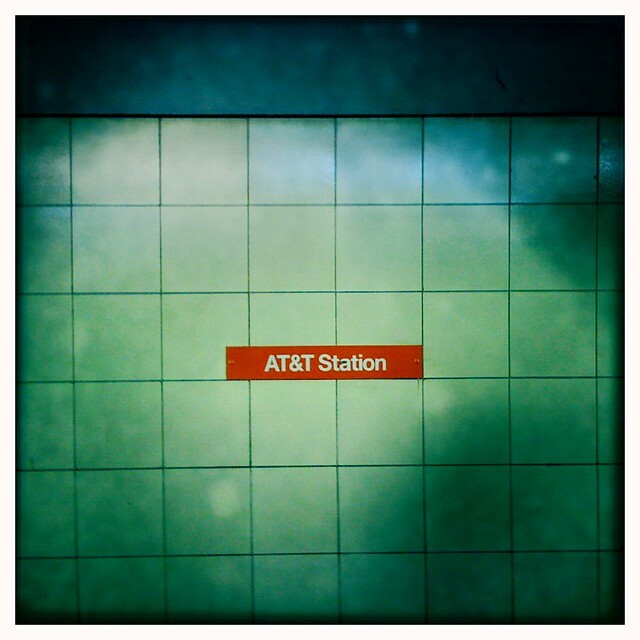 When you start renaming stations, however, that’s what you’re doing. It creates confusion, and it clashes with the systemwide practice of naming stations according to streets. There are aspects of our public infrastructure that I think we as a city should be too proud to rent out to corporate interests, and station names is one. On the other hand, names that we’ve become accustomed to – such as Times Square, Herald Sq, Pennsylvania Station (which was of course not named after the man or the state but the RR company) – are part of the urban landscape and don’t bother me at all. So, maybe in 50 years everyone will take the A train to Verizon Station and not think twice about it. after a while, just maybe. i’ll never call it the RFK bridge, but the media are on board and after a generation listening to the stations that carry traffic reports, how many will be calling it the triboro? Maybe they should name stations after politicians, so that they stop stealing money from the MTA.